Real Golf de Bendinat has renewed all its greens. What’s new about the four popular 18-hole golf courses in the south west of the island – the Real Golf Bendinat, the Golf de Andratx Golf de Poniente and the Golf de Santa Ponsa? As one of the oldest and most prestigious golf courses on the island, Real Golf de Bendinat has renewed all its greens. Two months – July-August – saw continued renovation work on the 18 “royal” greens. Since early September, the doors have been open again. To show off the greens in peak condition, the tournament season starts in Bendinat, according to information provided by the club leaders in November. Major tournaments take place in October at the Golf de Andratx. The autumn season starts here with the October Competitions Day on October 2nd. The next day a tournament begins, which enjoys great popularity: On 3rd and 4th October, the Mallorca Magazine Golf Trophy will be held in Camp de Mar. Those who want to participate should hurry, as even though this tournament was expanded from the previous one to two days, the waiting list is getting longer. Until Friday 3rd October, you can register by providing your credit card number to info@golfdeandratx.com. The registration fee is 159 euros per person. It includes a grand gala evening on the 4th October in the Dorinth Hotel with an award ceremony, scorecards and exciting raffle prizes. Besides the Dorinth kitchen, the Club Restaurant on Golf de Andratx “Campino” and the restaurant “Tristán” at Puerto Portals Mallorca cater for golfers as partners of the magazine. 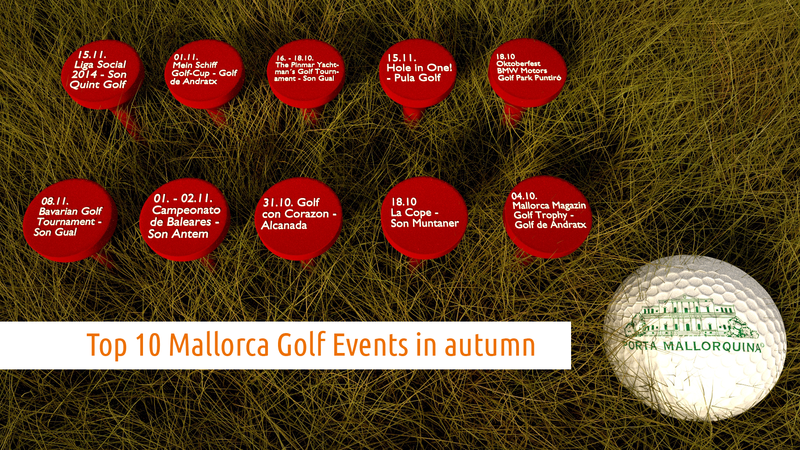 The tournament calendar known as “Diva” by the golf courses in Mallorca at Golf de Andratx is fully booked in October: It continues with the popular Ladies & Men’s Tournament on 9th October, the club’s Camp de Mar Members & Guests Cup on 16th October, and the Single Stableford Golf Cup on 23rd October. On November 1st, the final of the Mein Schiff Golf Cup 2014 will also be held with grand Golf Gala on the greens in Camp de Mar. The south-westerly golf course awaits with new fashion news: The first golf collection Holy Shot made ​​by Stefan Kretschmar has been marketed since the end of July exclusively at Golf de Andratx. Finally, this place is the house and courtyard of the former handball icon. Kretschmar is only one of several celebrities who like to take on hole No. 6, the “Green Monster”. That’s nothing new, but always fun – with a length of fabled 609 metres from the tee this is likely to be the longest in Europe. A par or a birdie here could probably only be achieved by the real long hitters! And the golf courses of Santa Ponsa? In first place are the participants of the II Mallorca Greensomne ​​Capman Trophy on October 18th with hole no. 10 and at 590 metres, the second longest hole from tee. And on November 8th, the Santa Ponsa V. Golf Trophy of the hotel Port Adriano is constested. Did you know that anyone who wants to brag to his friends that they played golf “around the whole island“, only need to tee off in Santa Ponsa? The final green here consists of an artificial island in the shape of the island of Mallorca. Unfortunately it can only be explained by club members. 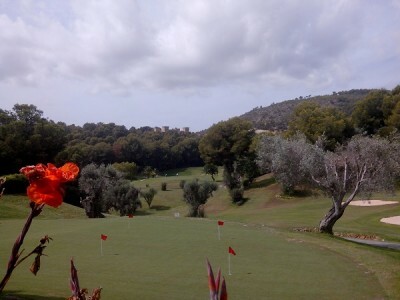 From the fourth Golf Course in south west Mallorca, the Golf de Poniente, there is nothing really new to report. It‘s just still one of the most popular green-free courses on the island with an animal oddity: About 50 wild chickens are currently living on the 160 acres of land and most of them cackle, chortle and peck at the elegant clubhouse. However, they do disturb anyone. Well then, we wish all our south west golfers – wherever you play – good luck!